Gas line installation benefits and value to homeowners cannot be overstated. When it comes to natural gas line installation, it is important to have a company that is aware of the requirements of the project. 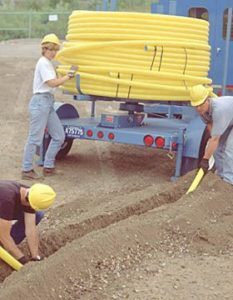 As a Denver gas line company, The Gas Connection has been able to serve our Colorado customers since 1980 and are well known for our expertise in this area. If you want low or high-pressure gas lines, we serve commercial, multi-unit, industrial and residential customers. Whether the lines are to be installed above or below ground, our highly trained personnel will make the gas pipe installation quick and efficient. There are specific federal and state regulations regarding the installation of natural gas lines. These are controlled by the Federal Energy Regulatory Commission and the U.S. Department of Transportation. Specifically, Colorado is governed by the Gas Pipeline Safety Division PUC. This means that our company must comply with strict regulations regarding the installation of natural gas lines. Our personnel has been extensively trained in gas line installation which assures that all gas lines we install are safe and secure. The benefits of natural gas have long been realized by environmentalists as well as the actual users. This means that you are enjoying the warmth and convenience of natural gas in an atmosphere that is kind to the environment. There are a number of places where natural gas is used. This includes appliances, fireplaces, outdoor BBQ’s and outdoor lighting in both residential and commercial areas. At The Gas Connection, we do not sell indoor or outdoor appliances but specialize in the installation of the gas line itself. Converting backyards or courtyards into places of beauty is one excellent use of this basic energy source. This allows a family to enjoy the benefits of things like tiki lights, a gas barbecue and other additions which will enhance their backyard. Many companies also use natural gas to enrich outside areas. With a gas barbecue, for example, the natural gas flames spread evenly and allow cooking over the entire area rather than concentrated in one spot. This provides a perfect surface for barbecuing or other types of cooking. Outdoor and indoor fireplaces are another location where natural gas is popular. Whether residential or commercial, a gas fireplace produces a feeling of complete relaxation and well-being. Natural gas line installation benefits so much in your home. Hot water heaters, spas, swimming pools, cooking appliances, fireplaces just to name a few. When these items are supplied with a natural gas line there is the assurance of a reliable form of heat. Because of the requirement for a large amount of electricity, many businesses turn to natural gas for its production. Natural gas powered turbines and reciprocating engines are used to produce this needed power. This has allowed companies to avoid power outages while enjoying high-quality and consistent electricity. Let’s not forget freedom from depending on regular electricity resources. Naturally, this type of natural gas electricity produces heat. Many innovative companies have used this additional heat to run commercial boilers and water or space heaters. This has saved them a great deal of money. The food service industry has long adopted natural gas as their preference for commercial cooking requirements. New advances in this area includes a Nontraditional Restaurant System which provides compact natural gas appliances for small-sized food businesses. This has allowed these businesses, located in malls, airports and other locations, to produce the same high-quality food as found in larger establishments. Natural gas is also reported to account for 13 percent of the energy used for cooling in commercial establishments. Since the cooling is done by reducing humidity in the air this requires less energy from their gas-fired cooling systems. TGC works with contractors, commercial, industrial, residential and multi-customers throughout the state of Colorado. We install low-pressure gas lines above or below ground and work with those who need this type of installation. Our services include natural gas line repair, natural gas commercial and residential gas line installation and appliance hookup. For more information give us a call at (303) 466-4206 or send us a message on our online form. We will be happy to discuss our services and will provide a free estimate of any installation you may require.